Here are 3 lovely covers from my recent eBay purchases to share with you. 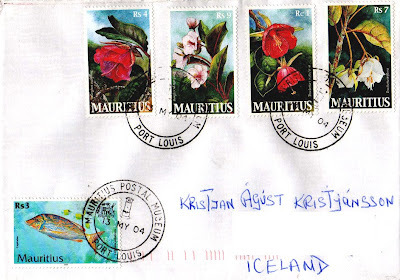 The first cover was sent from Mauritius to Iceland. Dated 13 May 2004, it bears postmarks from the Mauritius Postal Museum situated in the capital of Mauritius, Port Louis. The set of 4 beautiful flowers stamps franked on this cover were issued in 2003. 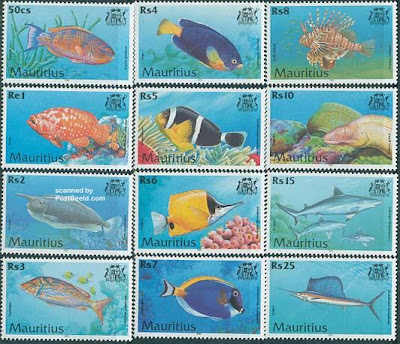 And the stamp franked on the bottom left belongs to the "Fishes of Mauritius" definitive set issued in 2000. 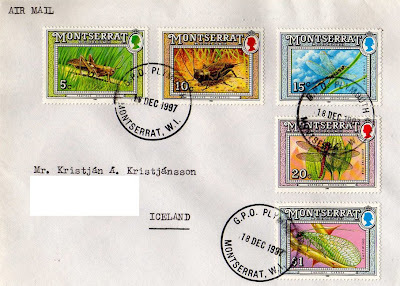 Next, we have this beautiful cover sent from Montserrat to Iceland in December 1997. First let me give you some information about the island. Montserrat is a British overseas territory located in the Leeward Islands, part of the chain of islands called the Lesser Antilles in the Caribbean Sea. It measures approximately 16 km long and 11 km wide, giving 40 kilometres of coastline. Christoper Columbus gave Montserrat its name on his second voyage to the New World in 1493, after its namesake located in Catalonia. Montserrat is often referred to as the Emerald Isle of the Caribbean, due both to its resemblance to coastal Ireland and to the Irish descent of most of its early European settlers. 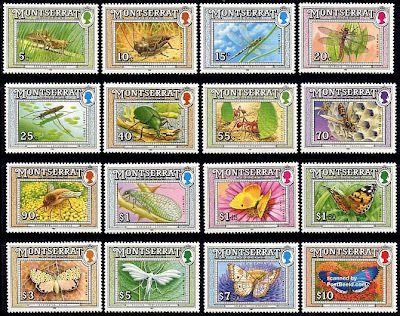 The 5 gorgeous stamps franked on this cover are part of 12 stamps from the "Insects & Butterflies" definitive series, issued in 1992. 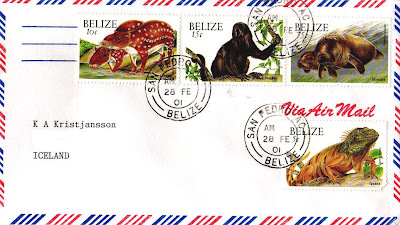 Last but not least, please check out this superb cover from Belize to Iceland. Belize, formerly British Honduras, is a country in Central America. Belize was affiliated with the British Empire prior to gaining its independence in 1981. Belize has a diverse society, composed of many cultures and speaking many languages. It is the only country in Central America where English is the official language. Kriol and Spanish are also widely spoken. With 8,867 square miles (22,960 km²) of territory and 320,000 people (2008 est. ), the population density is the lowest in the Central American region and one of the lowest in the world. Culturally, Belize considers itself to be both Caribbean and Central American. 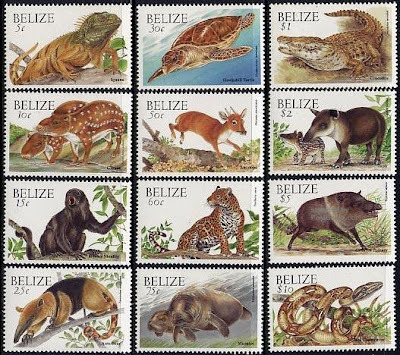 The 4 lovely stamps belong to the beautiful "Animals" defintive set issued in 2000. Till next post. Ciao!